Nautilus is the common name used to describe a group of marine animals in class Cephalopoda. These animals are commonly known for the beautiful shell in which it lives and are the only shelled Cephalopods alive today. Nautilus can be found in the coastal waters of the Southern Pacific and Indian Oceans and swim on the slopes of the coral reefs. During the day it stays in deeper parts of the ocean to avoid its predators, and then during the night it will rise up to 1,500 feet to look for food. Nautilus also prefer cooler water temperatures. The nautilus' size may range from 10.6 inches in diameter to 6.3 inches in diameter. They have around ninety tentacles used for gripping food, with a beak in the middle use to break the shells of its prey. Nautilus can withdraw themselves completely into their shells for protection and they also squirt out ink when threatened, like an octopus. It swims with the aid of jet-propulsion and can move backwards, forwards and sideways. The nautilus varies its buoyancy by changing gas levels within all the different sections within its shell. Fossil remains of nautilus like creatures are somewhat often found and are a common sight for those interested in marine fossils. The fossils are quite exquisite because of the way the shell remains intact and detailed through the fossilization process. Nautilus shell cut in half. The chambers are clearly visible and arranged in a logarithmic spiral known as the Golden spiral. The nautilus follows the common form of cephalopods in many areas of its anatomy. It's head is set partially out of its shell and has two eyes that lack lenses and cornea. Most nautilus have around ninety small sucker-less tentacles found on the body close to where it's attached to its shell. These tentacles are not similar to the tentacles of other cephalopods. They lack pads, but due to their rigid surface, can still grab prey and hold them strongly. Nautilus posses two pair of gills and a nine-toothed radula. Of all the cephalopods, the nautilus is the only one that has an external shell. The shell is very prized for its beauty; it has chocolaty-brown zebra stripes that adorn the smooth, white shell. The animal can pull itself all the way into this shell, covering the opening with a leathery hood formed by two folded tentacles. Up to 30 chambers are created in the shell as the animal increases in size and moves to occupy the outermost chamber. The chambered nautilus maintains buoyancy through a gas passed through a tube in the shell tube called a siphuncle. This also helps the animal stay upright in the water. The pattern of colors on the nautilus's shell aids in counter-shading. If one were to look down upon a nautilus, it would blend in well with the bottom of the sea because of its darker colors on the top portion of the shell. If one were to look up at a nautilus from below it, the light coloring would have a similar affect in camouflaging the animal. The cephlapod would blend in with the light colored water above it. Nautilus primarily use jet-propulsion for movement and it resides in waters 300ft to 2000ft deep. Nautilus do not lay a great number of eggs at one time. However, the eggs they do lay hatch large offspring that can take several years to become sexually mature. The life cycle of the nautilus starts with the attaching of fertilized eggs on to rocks in shallow water. The eggs take about twelve months to develop and hatch little nautilus that are around thirty millimeters long. 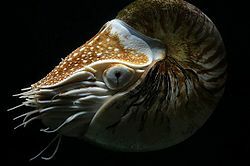 The nautilus' lifespan is quite long for cephalopods and they reach sexual maturity around the age of 15 (their whole life span is usually around 20 years). The mating process of nautilus can last 24 hours. The male transfers sperm to the female using its spadix, then the female uses the sperm and fertilizes about twelve eggs. The female lays its eggs one at a time or in small groups throughout the year. These eggs are among the largest invertebrate eggs lain, and again take quite a while to develop. But after a while the life cycle will begin again with the young nautilus. On a different note, nautilus are sexually dimorphic, meaning simply that one can distinguish the differences between the male and female. The eyes of nautilus are so ineffective that they rely on their fine tuned sense of smell to locate food. They locate food at night in somewhat shallow waters, using the smells carried by the ocean currents. Nautilus eat mainly small fish and crabs but will also feed on decaying organisms. Some of the predators that threaten the nautilus include octopuses, sharks, triggerfish, and turtles; these animals are able to penetrate the nautilus shell. Nautilus live in the tropical waters of the Pacific and Indian Ocean from the Andaman Sea east to Fiji and from southern Japan to the Great Barrier Reef. This animal usually lives where the slopes of coral reefs descend into deep waters. They reside on the slopes so that they are more protected in the day in deeper waters but can still easily travel up to their feeding grounds. The nautilus' shell is extremely unique and beautiful. For these reasons, the shell is pursued by humans. In order to obtain the shell, the nautilus is killed in the "hunting" process. This is the sad reality nautilus have had to deal with for an extremely long time. Nautilus shells were very popular in the Renaissance and were a part of the cabinet of curiosities. The cabinet of curiosities were collections of odd things that most people did not know about at the time. Also, the Renaissance goldsmiths would mount the nautilus shells to serve as drinking cups which were primarily decorations. And still today, one can find real nautilus shells for sale on the internet. Because of the long term hunting, nautilus populations have remained relatively small. 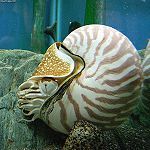 If the trade of nautilus shells stays at its current rate or grows, it is likely that for the nautilus species to survive, measures to aid in population expansion will be taken. Nautilus shell showing the Golden spiral (fibonacci sequence). Nautilus pompilius in an aquarium. ↑ Willey, Arthur. Memoirs: The Pre-ocular and Post-ocular Tentacles and Osphradia of Nautilus Quarterly Journal of Microscopical Science 1897 s2-40:197-202. This page was last modified on 8 January 2012, at 14:02.